I have worked as a cook for most of my life. My mama, Letitia Kernohan from Minden was a cook before she married my daddy. After she married and began her life on the farm, she cooked to feed her family, their hired men and a steady stream of guests. I learned much of what I know about cooking from her as so much of my early life was spent in our farm kitchen. I loved it then and I still do today. At the age of 16, I began cooking at the lodges, hunt camps, logging camps, Girl Guide camps, Junior Forest Ranger camps, inns, hospitals, and for many local church and community events. Through most of those years elected recipes; recipes from neighbours, relatives, friends and family, and just about anyone who would share them with me. Many of the recipes I have collected were in the author’s own handwriting which makes them even more special to me. I have talked for years about putting a cookbook together, so when the Dorset Museum contacted me about preparing this one it seems like the timing was right. It was what I needed to get me going in transferring them from handwriting to the printed page. I mentioned the project to several of my friends and before long I had been generously given many more recipes to add to my collection. Thank you to all who have so graciously offered your family recipes for all of us to enjoy. 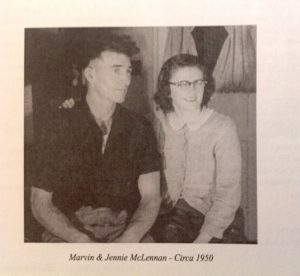 Throughout the book, I have not only noted the name of the person who gave me the recipe but also my relationship to these people, some of my memories about that person or a story they have offered about their recipe or some other information about their family in our community. Occasionally I have included a story I remember relating to the recipe. I hope these little vignettes add to the enjoyment of this book. Most of the recipes in this first collection has been gathered over my lifetime from friends and family in the Muskoka and Haliburton communities. Many of these friends and family are missed dearly now, but they are remembered through their stories and the fond memories of the wonderful times we have shared together over good food. 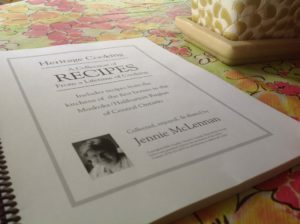 Many of us grew up knowing Jennie and the other contributing community members of this wonderful collection of recipes. It is a trip down memory lane every time you pick it up and go through it looking for a recipe.